The government's £3bn clean air strategy does not go "far enough or fast enough", campaigners have said. Moves including banning the sale of new diesel and petrol cars from 2040 and £255m for councils to tackle air pollution locally have been welcomed. 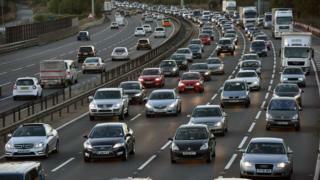 Transport Secretary Chris Grayling said the government was determined to deliver a "green revolution". But environmental groups criticised the decision not to include a scrappage scheme or immediate clean air zones. The plan to stop all sales of petrol and diesel cars by 2040 is part of the government's intention for almost every car and van on UK roads to be zero emission by 2050. The government report includes the promise of £40m immediately to start local schemes rolling, which could include changing road layouts, retrofitting public transport or schemes to encourage people to leave their cars at home. The funding pot will come from changes to tax on diesel vehicles and the reprioritising departmental budgets - the exact details will be announced later in the year. If those measures do not cut emissions enough, charging zones for the most polluting vehicles could be the next step. While air pollution has been mostly falling in the UK, in many cities, nitrogen oxides - which form part of the discharge from car exhausts - regularly breach safe levels. Mr Grayling said the new plan showed the government was "determined to deliver a green revolution in transport and reduce pollution in our towns and cities". But campaigners say these are the measures that need to be implemented now to tackle environmental and health problems, with air pollution linked to about 40,000 premature deaths a year in the UK. Professor Neena Modi, president of the Royal College of Paediatrics and Child Hea lth, said air pollution "is a public health emergency" and said it was "frankly inexcusable" that the plans still did not go far enough. Green Party MP Caroline Lucas welcomed the 2040 announcement, but added: "We also need action that tackles this health emergency in the coming months and years. "We should use this opportunity to revamp our towns and cities with investment in walking and cycling, and by ensuring that public transport is affordable and reliable." Greenpeace UK's clean air campaigner Areeba Hamid said 2040 was "far too late" and called for the UK to "lead the world in clean transport revolution". And ClientEarth - the law firm that took the government to court over pollution levels - said the plans were "underwhelming" and "lacking in urgency". The shadow environment secretary, Labour's Sue Hayman, said the plan saw the government "shunting the problem on to local authorities" and accused it of having a "squeamish attitude" towards clean air zones. "With nearly 40 million people living in areas with illegal levels of air pollution, action is needed now, not in 23 years' time," she added. Liberal Democrat and former Energy Secretary Ed Davey criticised the lack of scrappage scheme as a "shameful betrayal" of diesel car drivers, and said it showed "the utter lack of ambition" of the plan. And London Mayor Sadiq Khan said people in the capital were "suffering right now" because of air pollution and "can't afford to wait". The AA also said significant investment would be needed to install charging points across the country for electric vehicles and warned the National Grid would come under pressure with a mass switch-on of recharging after the rush hour. The government said a new bill would allow it to require the installation of charge points at motorway service areas and large fuel retailers. Local Government Association environment spokesman Martin Tett welcomed the additional funding, but opposed holding off on a scrappage scheme, arguing "this immediate intervention could help increase the uptake of lower emission vehicles". BBC environment analyst Roger Harrabin said councils were not happy to be taking the rap for the controversial policy when it was the government that had encouraged the sale of diesel vehicles in the first place. "Today's government plan is not comprehensive - it doesn't address pollution from construction, farming and gas boilers," he added. "And clean air campaigners say the government is using the 2040 electric cars announcement to distract from failings in its short-term pollution policy." Ford's chief financial officer Bob Shanks told the BBC that he supported the ban and believed that Europe would be "ground zero" in leading a global trend to electric vehicles. "We certainly see that trajectory being quite feasible, and is something that we support," he added.